Comments for 15ct with 2 Rubies and Pearls. What Year? Hi Andy thanks for your question. 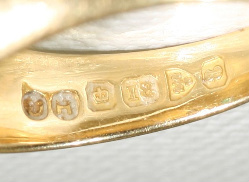 The Jewelry Marks are British hallmarks. The assay office mark looks like Chester (second mark from right). Below is a photo of the Chester town mark for you to compare, as the photo of the mark is not all that clear. There doesn't look to be a decimal point before the millesimal value therefore the ring dates Before 1931. The date letter "B" in fact confirms this for me as it is dated - 1885. In case you were wondering what the object is between the three sheaves of wheat, it's a sword. Return to 15ct with 2 Rubies and Pearls. What Year? .